El acróstico APACHE (Acral Pseudolymphomatous Angiokeratoma of Children) corresponde a una variante de los seudolinfomas cutáneos. El término fue introducido por Ramsay, et al., en 1988, cuando publicaron cinco casos de pacientes pediátricos con múltiples pápulas angiomatosas, unilaterales, que se localizaban en la región distal de las extremidades. En el estudio histopatológico se observaba un infiltrado dérmico linfohistiocitario nodular con capilares prominentes. En la actualidad, los nombres de “seudolinfoma de pequeñas pápulas” o “hiperplasia angiolinfoide papulosa” serían los más convenientes, ya que no siempre se presenta en niños, es de localización distal o se observan cambios angiomatosos en el estudio de histopatología. Se presenta el caso de una niña con una lesión distal en el segundo dedo del pie izquierdo, cuyo diagnóstico de angioqueratoma distal seudolinfomatoso infantil se hizo mediante el estudio histopatológico. Además, se hacen comentarios sobre esta rara entidad. Acral pseudolymphomatous angiokeratoma of children (APACHE) is a variant of cutaneous pseudolymphomas. In 1988, Ramsay, et al., reported five pediatric presenting with unilateral, multiple, persistent angiomatous papules on acral regions of the hands and feet. The histopathology of the lesions revealed a dermal lymphohistiocytic infiltrate well circumscribed with prominent thickened capillaries. Since the condition presents not only in childhood but also in adulthood and it is not characterized histopatohologically by the presence of angiomatous features, it is compelling to change the designation to “small papular pseudolymphoma” or “papular angiolymphoid hyperplasia”. We present a one pediatric patient with an acral lesion (second toe of the left foot), whose diagnosis was reached through histopathology. We also make comments about this rare entity. Figura 1. Placa elevada y de superficie áspera, de color rosado-amarillento y con pequeños puntos rojo-violáceos dispersos. Figura 2. En la epidermis se observa acanto-papilomatosis, hiperqueratosis y moderado infiltrado inflamatorio mononuclear dérmico superficial. Hematoxilina y eosina, 40X. Figura 3. Moderado infiltrado inflamatorio mononuclear dérmico superficial, y aumento del número de vasos sanguíneos, con endotelio prominente y dilatación de su luz. Hematoxilina y eosina, 100X. 1. Ramsay B, Dahl MGC, Malcolm AJ, Soyer HP, Wilson-Jones E. Acral pseudolympho¬matous angiokeratoma of children (APACHE). Br J Dermatol. 1988;119(Suppl.33):13. 2. Crow KD. Case of diagnosis. Br J Dermatol. 1980;103(Suppl.18):78. 3. Ramsay B, Dahl MGH, Malcolm AJ, W Wilson-Jones E . Acral pseudolymphomatous angiokeratoma of children. Arch Dermatol. 1990;126:1524-5. 4. 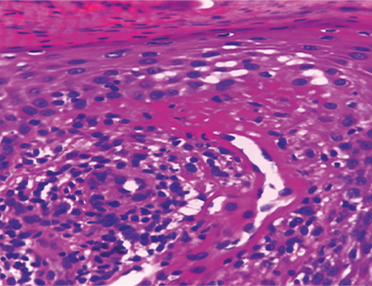 Hara M, Matsunaga J, Tagami H. Acral pseudolymphomatous angiokeratoma of children (APACHE): A case report and immunohistological study. Br J Dermatol. 1991;124:387-8. 5. Kaddu S, Cerroni L, Pilatti A, Soyer P, Kerl H. Acral pseudolymphomatous angiokeratoma: A variant of the cutaneous pseudolymphomas. Am J Dermatopathol. 1994;16:130-3. 6. Kerl H, Ackerman AB. 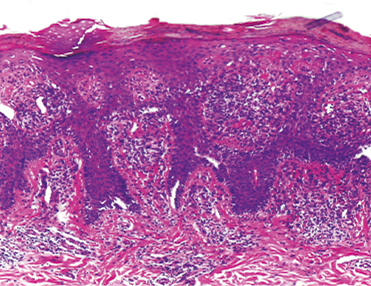 Inflammatory diseases that simulate lymphomas: Cutaneous pseudolymphomas. In: Fitzpatrick TB, Wolff K, Goldsmith L, Katz S, Gilchrest B, Paller A Leffell D. Dermatology in general medicine. Fourth edition. New York: McGraw-Hill; 1993. p. 1315-27. 7. Fernández-Figueras MT, Puig L. Of APACHE and PALEFACEs. Am J Dermatopathol. 1995;17:227-9. 8. Okada M, Funayama M, Tanita M, Kudoh K, Aiba S, Tagami H. Acral angiokeratoma-like pseudolymphoma: One adolescent and two adults. J Am Acad Dermatol. 2001;45:209-11. 9. Murakami T, Ohtsuki M, Nakagawa H. Acral pseudolymphomatous angiokeratoma of children: A pseudolymphoma rather than an angiokeratoma. Br J Dermatol. 2001;145:512-4. 10. Okuda C, Ito K, Ito M. Acral pseudolymphomatous angiokeratoma of children: A case with a lesion on the wrist. Acta Derm Venereol. 2002;82:301-2. 11. Hagari Y, Hagari S, Kambe N, Kawaguchi T, Nakamoto S, Mihara M. Acral pseudolymphomatous angiokeratoma of children: Immunohistochemical and clonal analyses of the infiltrating cells. J Cutan Pathol. 2002;29:313. 12. Ohtsuka T, Yamazaki S. Acral angiokeratomalike pseudolymphoma in a 28-year-old Japanese woman. Dermatology. 2003;207:77. 13. Kiyohara T, Kumakiri M, Kawasaki T, Takeuchi A, Kuwahara H, Ueda T. Linear acral pseudolymphoTabla 2. Diagnósticos diferenciales histopatológicos Entidad Clínica Claves hispatológicas Liquen nitidus Linfoadenosis cutánea benigna Pápulas pequeñas Nódulo solitario en cara Pápulas y nódulos en tronco y extremidades. Resuelven espontá- neamente dejando cicatriz Papulosis linfomatoidea Reacción a picadura de atrópodos persistente DIAGNÓSTICOS DIFERENCIALES HISTOPATOLÓGICOS Angioqueratoma distal seudolinfomatoso infantil (APACHE) Rev Asoc Colomb Dermatol. 2018; 26 : 1 (enero - marzo), 40-47 47 matous angiokeratoma of children (APACHE): Further evidence that APACHE is a cutaneous pseudolymphoma. J Am Acad Dermatol. 2003;48:S15-7. 14. Lee MW, Choi JH, Sung KJ, Moon KC, Koh JK. Acral pseudolymphomatous angiokeratoma of children (APACHE). Pediatr Dermatol. 2003;20:457. 15. Kim Y, Dawes-Higgs E, Mann S, Cook DK. Acral pseudolymphomatous angiokeratoma of children (APACHE). Australas J Dermatol. 2005;46:177. 16. Freire FMZ, Filho JBS, Cintra LC, Diniz LM. Acral pseudolymphomatous angiokeratoma – a case report. An Bras Dermatol. 2006;81:S277-80. 17. Okuyama R, Masu T, Mizuashi M, Watanabe M, Tagami H, Aiba S. Pseudolymphomatous angiokeratoma: Report of three cases and an immunohistological study. Clin Exp Dermatol. 2009;34:161. 18. Chedraoui A, Malek J, Tamraz H, Zaynoun S, Ghani A, Ghosn S. Acral pseudolymphoma¬tous angiokeratoma of children in an elderly man: Report of a case and review of the literature. Int J Dermatol. 2010;49:184-8. 19. Freemont AJ, Ford WL. Functional and morphological changes in post-capillary venules in relation to lymphocytic infiltration into BCG-induced granuloma in skin. J Pathol. 1985;147:1-2. 20. Tokuda Y, Arakura F, Murata H, Acral pseudolymphomatous angiokeratoma of children: A case report with immunohistochemical study of antipodoplanin antigen. Am J Dermatopathol. 2012;34:8. 21. Fernández-Flores A, Fierro S, Larralde M. Expression of WT-1 by the vascular component of acral pseudolymphomatous angiokeratoma of children. J Cutan Pathol. 2015;42:50-5. 22. Gansz B, Ständer S, Metze D. Akrale pseudolymphomatöse angiokeratome der kindheit (APACHE). Hautarzt. 2005;56:270-2. 23. Wagner G, Rose C, Sachse M. Papular pseudolymphoma of adults as a variant of acral pseudolymphomatous angiokeratoma of children (APACHE). J Dtsch Dermatol Ges. 2014;12:423-4. 24. Lessa P, Ferreira J, Ferreira F, Mandelbaum S, Ferreira J, Alveranga M. Acral pseudolymphomatous angiokeratoma: Case report and literature review. An Bras Dermatol. 2013;88(Suppl.1):39-43. 25. McFaddin C, Greene J, Parekh P. Linear acral pseudolymphomatous angiokeratoma of children with associated nail dystrophy. Dermatol Online J. 2015;15;21. 26. Yeo YW, Oon HH, Lee JS, Pan JY, Mok YJ, Ng SK. Papular angiolymphoid hyperplasia and lymphoplasmacytic plaque: A clinical and histological spectrum. Dermatol Online J. 2016;22:4. 27. Fonia A, Bhatt N, Robson A, Kennedy CT. Acral pseudolymphomatous angiokeratoma of children (APACHE)-like eruption in adult identical twins. Clin Exp Dermatol. 2016:41:751-3. 28. Pinos-León VH, Granizo-Rubio JD. Acral pseudolymphomatous angiokeratoma of children with rainbow pattern: A mimicker of Kaposi sarcoma. J Am Acad Dermatol. 2017;76(2S1):S25-7.